In January 1984 Michael Eavis successfully defended 5 prosecutions bought against him by Mendip District Council alleging contravention of the previous year’s licence conditions. All five charges were dismissed after a day long hearing at Shepton Mallet Magistrates Court. The local council then announced that the licence for 1984 would cost £2,000. The licence numbers were set at 35,000 and for the first time specific car parking areas were designated with stewards employed to direct the traffic. Messages were also broadcast on the radio to advise people not to turn up unless they had purchased a ticket in advance. 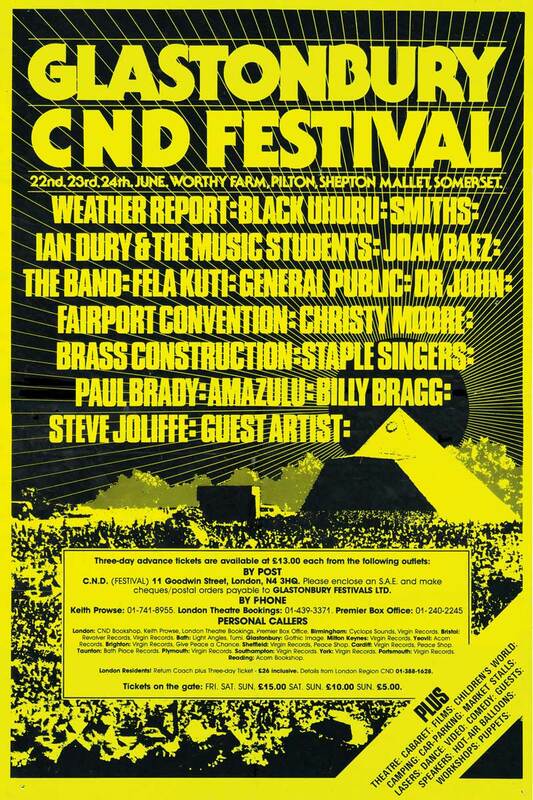 1984 also saw the start of the Green Fields as a separate area within the Festival. £60,000 was raised for CND and other charities. Acts included: The Waterboys, The Smiths, Elvis Costello, Joan Baez and Ian Drury. Guest speakers included Bruce Kent, the chairman of CND and Paddy Ashdown. Attendance: 35,000. Tickets: £13. Programme price: 80 pence.